Sunday Streets keeps on growing, with 10 car-free events coming to neighborhoods around the city this year. This year’s schedule includes four consecutive months of the ever-popular Mission route, a new route in the Excelsior, and a modified route through Golden Gate Park. The Civic Center/Tenderloin route was also taken off the table this year due to logistical challenges, but it is expected to return. Why so many events in the Mission? 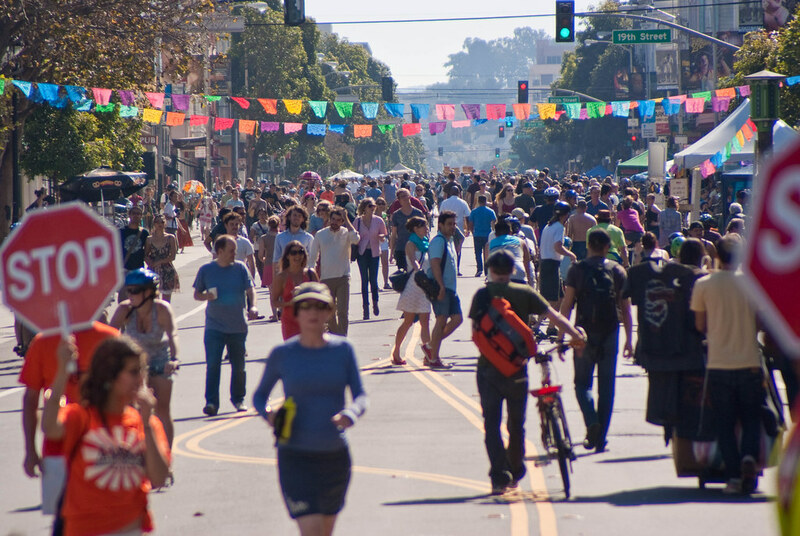 Sunday Streets organizer Susan King said planners are using the route to evaluate the potential for a recurring event, with the goal of establishing weekly events like those in Bogotá, Colombia, which originally inspired Sunday Streets. In April, the Great Highway/Golden Gate Park route will be partly moved off of John F. Kennedy Drive onto Middle Drive and Martin Luther King Drive to create a more intuitive route that requires fewer staff to direct traffic, said King. In past events, the middle stretch of JFK west of Transverse Drive has seen few people stopping, she said, and Middle Drive is already off limits to through car traffic. The change would also remove a sharp turn on the western end of the route, making it easier to follow (see the map below). The route could also happen more regularly in coming years, as King noted that plans are in the works to close the Great Highway south of Sloat Boulevard due to continuing erosion along the beach. The highway is already regularly closed to car traffic because of sand blockages. In the Outer Mission/Excelsior neighborhoods, where King says merchants and residents have “not let up” in asking the city to bring Sunday Streets, a new route is being planned to finish off the season in October. King also noted that the Civic Center/Tenderloin route — which was marred by rain one year and by the Outside Lands festival the next — won’t happen this year. Planners hope to create a more attractive route in future years that is less disruptive to Muni and requires fewer staff to direct traffic. “It was, for a variety of reasons, our least well-attended route, and also double the cost of some of our other routes,” said King. San Franciscans can also look forward to returning events on the Embarcadero, Bayview, Chinatown, and Western Addition/NoPa. The new Golden Gate Park route (in yellow) compared with the old one (in red). It’s a bit discouraging to see the Mission get all the attention, at the expense of other neighborhoods, but I keep forgetting in SF if it’s not in the Mission it doesn’t matter. Hope the Mission events are all different, instead of the same streets every time. Also would be nice to make the Mission routes longer to spread out the crowd. Maybe including Twin Peaks and the Wiggle. Wow, I recognize it’s tough to balance giving people what they want (like more opportunities to attend the most highly attended Sunday Streets) with what they *should* want (like enjoying Excelsior or the TL). But comments pushing for a zero-sum game of my neighborhood at the expense of the Mission are missing the point: more and regular car-free hours/days on our public space is great. Let’s have one in the Mission or Chinatown every month (where it will easily be sustained) and have another traveling Sunday Streets each month too (I doubt other neighborhoods would want a monthly ‘street closure’ until it has been a proven success like in the Mission). Didn’t they decide to have so many in the Mission because this location has traditionally led to the largest turnout? But I say share the love: keep all the current ones, but add more! I’m especially wish there were more in September and October, which is when we really get our summer weather. I think starting in June and going through October, they should have 2 a month. I think there’s a good reason to use the same route: it makes it regular and people know what’s going on and expect it. This minimizes disruptions to their habits and plans, and you have fewer frustrated people who demand to get into or out of their garages. If people are aware of it and know to drive around it, that might also allow for fewer vehicle crossings, which would be nice– less disruption and lower cost (fewer police and volunteers needed). I’m not thrilled about the new GGPark route. That route is immensely more difficult in inclination than JFK. The road is in much worse condition too which will be difficult for skaters and skate boarders. People with heavy bikes, sound systems, the piano bike or the 6 person party bike will have much more difficulty on the new route. Also people that rent bikes will have more of a challenge getting over to the new route. I never had difficulty finding the turn at the other route w/o the help of volunteers. Although the volunteers are a nice plus, I’ve never thought they were absolutely necessary – signs are enough or chalk arrows on the pavement. I would really like SS to consider adding another Embarcadero route or routes in other neighborhoods instead of more routes given to the Mission. The Mission has had a good allotment of routes in the past, even more this year and from the sounds of it, adding more each year. The Embarcadero offers amazing views, businesses like at FWharf and Ferry Bldng, the pavement is in great condition, it’s quickly accessible for people coming from the East Bay off of BART and it’s flat which makes it accessible for everyone. I once met a 75 year old woman on a cruiser who hadn’t ridden her bike in 30 years but came to the Embarcadero route because she knew the street was wide, the pavement smooth and the route flat. I concur. That stretch of road in GGP is in significantly worse condition than the newly repaved JFK. And frankly I don’t understand what was confusing about the old route. A good reason for different routes is to expose participants to different parts of town and different businesses along the route. Many businesses really like the additional walk in traffic on Sunday Streets days, especially in places like the Mission where there are a lot of family-friendly businesses (bakeries, cafes, etc.). If they don’t like all the turns, why don’t they just enter the park at the main JFK entrance, near the windmill? Then it is a pretty straight shot all the way through the park. I like how you mention the “piano bike” and the “6 person party bike” in such a matter of fact fashion. Good point on Middle Drive. While a nice car-lite space, it’s not really 8-80 friendly with the pavement in its current condition.